The first thing that your guests see is your entry door. If your front exterior doors are less than perfect, it might be time for a new front door from TGS Garages & Doors. 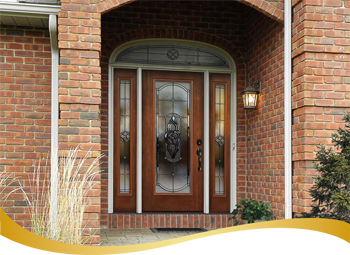 All of our high-quality doors are professionally crafted. We pride ourselves on customizing a door for your entry way. We carry a large selection of ProVia including; Signet Fiberglass, Heritage Fiberglass and Legacy Steel designs to fit all budgets and styles. No other company can offer the same level of expertise on entry door installations as TGS Garages & Doors. Learn a little more about what makes ProVia the best front door replacement model that you can buy! We know how busy you are and how valuable your time is so we make the design process easy and convenient. We start with knowledgeable customer care reps who are available when you are, design consultants who bring the showroom to the convenience of your home and back our process and products with our “exclusive no-risk guarantee”. Your experience starts with knowledgeable customer care reps who are standing by to provide support and schedule appointments until 9PM, even Saturdays : ) They put you at ease by answering questions, providing product information and asking relevant questions to help you define your goals and priorities. Take a photo of your home and use our innovative software to help you design and visualize the perfect entry door in real time. All of this is done from the convenience of your home, where you can see the nuances that might impact your decisions. Provide a showroom experience with actual entry door material samples, different insulation options, window designs, color and glass samples so you can see, touch and feel your selections from the comfort of your own home. You can even jump on door panels to check out the quality and durability.